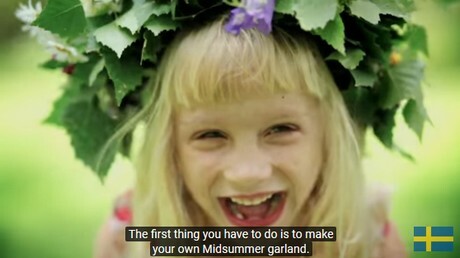 It's almost time for one of the most typical Swedish traditions: Midsummer. Friends and family gather to celebrate summertime and the season of fertility by eating, drinking, dancing and singing. Apart from food and drinks, flowers also take a piece of the pie, as they are used to decorate the festivities this weekend. "It is not the most important day of the year, but still sales always increase", says Christian Muhr, owner of APH, a Swedish importer of flowers. Mother's Day is, according to Muhr, the most important Swedish holiday for flowers, when sales increase by 500 percent. "Nevertheless for Midsummer, flower sales are higher than a normal week, around 100 percent." Red, white and blue are the most important colors, and the sales of these colored flowers are always increasing in the week before Midsummer. "The blue cornflower is the traditional favorite that can be found in almost every arrangement. They are supplied by small Swedish growers who grow them on the countryside. The red and white colors in the arrangements are provided by red roses and/or red carnations and white chrysanthemums that often originate from Kenya and Colombia. Sometimes, one also uses a touch of yellow, a color that signifies Sweden." The weather forecast for this weekend is not that good; rain, wind and possibly snow, reported Swedish newspaper The Local. But according to Muhr, this does not make a difference. We are used to having bad weather during Midsummer, it does not affect the positive mindset of all who are celebrating, nor does it affect the flower sales." APH supplies retailers and wholesalers all over Sweden, and for Muhr, the job is done now. "Everything is at the store and most of the Swedish people are now already preparing for Midsummer's Eve (June 22), which marks the start of Midsummer." 2019-04-11 White lily - the new poinsettia?